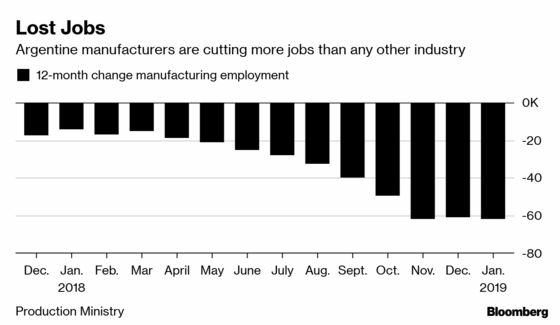 (Bloomberg) -- Argentine factories are shedding more jobs in the country’s recession than any other sector, testing President Mauricio Macri’s pro-trade pledges just months before he faces re-election. Manufacturers eliminated 62,000 posts between this January and last, according to government numbers published Thursday. That amounts to almost half the total number of jobs shed by the entire private sector in that period, and compares to 42,000 positions lost in retail, the second-worst hit industry. 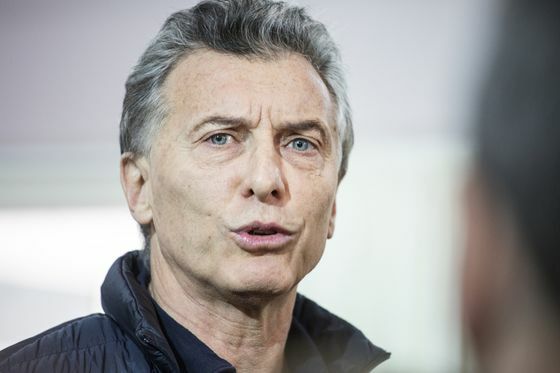 Macri swept to power in 2015 with overtures to businesses, arguing that opening up the economy would attract more investment and better jobs while reducing poverty. Since then, he has disappointed local industries by failing to implement labor and tax reforms that executives deemed essential to better compete globally. Add to that plummeting demand and the world’s highest interest rate, and now many manufacturers want tariffs to stay in place. Argentina saw a surge in imports in 2017 before a currency crisis sunk the country into its second recession in three years. When put together, many manufacturers couldn’t keep up. Mariano Privitera is one of the many company owners who got crushed and is closing his business. His soccer ball factory already faced the highest labor costs in Latin America when a surge of imported China-made balls set him back. Argentina’s downturn was the final nail in the coffin, said Privitera, who voted for Macri in 2015 but won’t do so this year. "They’re throwing us out to sea for the sharks if they open up the economy any more with such high fixed costs," he said. "There isn’t enough protectionism." There are signs the pain is widespread. Even while shielded by tariffs, elevator manufacturers cut total headcount to 15,000 from 18,000 at the start of Macri’s term, according to Leonardo Diletto, president of industry association Facara. As interest rates shot up, construction projects shuttered and the housing market collapsed, meaning elevator demand plunged too. To be sure, some companies have still managed to grow. Ball Corp., a U.S.-based company that manufactures aluminum beverage cans in Argentina, saw its employee headcount increase 15 percent in the last two years. It plans to grow further in 2019 as more clients opt for aluminum over other materials like glass, a spokeswoman wrote to Bloomberg. That’s little consolation for those who lost their jobs at Privitera’s factory, where he’s down to five independent contractors from 20 a year ago and 50 in 2017. They’re finishing up final orders before the business shutters for good.